Wyoming Seminary’s Mock Trial team recently competed in the prestigious Empire City Invitational Mock Trial Competition held in Brooklyn, New York. 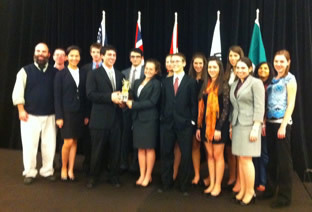 The competition featured 30 mock trial teams from schools in the United States and five other countries. Sem’s team took fourth place in its first appearance at the competition. Competitions involve two opposing high school teams who apply real-life statutes and case law to fictitious situations in a simulated trial setting. Visit www.wyomingseminary.org for additional information on the mock trial competition. Wyoming Seminary’s team is coached by Catherine O’Donnell, Pennsylvania Super Lawyer in 2007, 2008 and 2009. Catherine is a part time associate and business manager with O’Donnell Law Offices in Kingston, Pennsylvania.